Comments: U2 returns to Boston proper (and the TD Garden) for the first time since 2005. 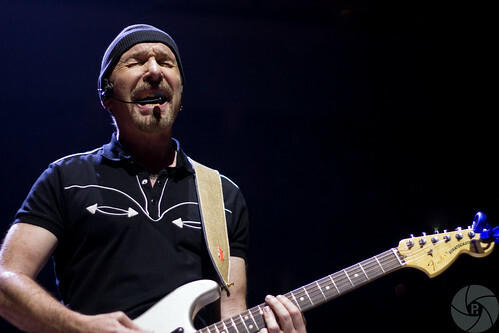 (U2's 360 shows were played in nearby Foxborough, Mass.) Before the show, the band poses for a photo in front of its video screen, which shows a photo of Irish MMA fighter Conor McGregor, who's hoping to win a UFC title fight tomorrow. Bono dedicates "Song For Someone" to Norman, and later tells the crowd that his brother is in the building to see his first show of this tour. At the intermission break, a new set of banners hang from the ceiling. They show similar Berlin Wall imagery as what's on the video screen and help to nearly divide the entire arena in half. Bono sings "Pride" for the survivors of the Boston Marathon bombing and praises the city for its strength while the #BostonStrong hashtag is shown on the video screen. "40" isn't on the printed setlist, but Bono tells the crowd that the band feels compelled to perform it tonight and he dedicates the song to the late Dennis Sheehan.